The Palestinian Youth Movement (PYM), a pro-Palestinian activism organization which has gained prominence on US campuses in recent years, and especially on those of the University of California, has been promoting acts of terrorism against Israel and has associated itself with US-designated terror organizations, according to an extensive new report on the organization. PYM, a political, international organization, has been exposed as an organization that justifies terror attacks and supports members of US-designated terror organizations such as Ghassan Kanafani, a leader of the Popular Front for the Liberation of Palestine (PFLP) and Khader Adnan, a leader of the Palestinian Islamic Jihad. An extensive report by a monitoring group on PYM’s activities in the US found that in July 2018, the Critical Refugee Studies Collective, supported by the University of California, awarded a grant to PYM to help fund a three-day conference in San Francisco commemorating “70 years since the Nakba.” While PYM claimed that the goal of the conference was “to formalize ties between our collective of transnational, politically-active Palestinian youth and the wider Palestine solidarity community within the US through a gathering themed around the revitalization of the Palestinian struggle at an important historical juncture,” the conference endorsed violence and hate toward Israelis. On July 29, the last day of the Nakba conference, PYM uploaded a video to its official Facebook page featuring a gathering of dozens of people chanting various slogans in Arabic. The slogans included those calling for the kidnapping of Israeli soldiers and violent uprising. One of them was “Son of Gaza, kidnap a soldier and free our prisoners. No siege and no hunger – no trading with the blood of the martyrs.” This appears to be a direct promotion of acts of terrorism. Similarly, they were chanting “Intifada, Intifada, Long live the Intifada!” apparently calling for violence and war. The phrase “Son of Gaza, kidnap a soldier and free our prisoners” has been used frequently in recent years by Arabs during protests in the PA in support of prisoners. In the Palestinian context, the Intifada is a violent uprising against Israel. This violence, against both Israeli citizens and Israeli security forces, has taken the form of suicide bombings, shootings, stabbings, and car-ramming attacks. When PYM activists shout “Intifada, Intifada, Long live the Intifada!” they are in effect calling for violence and war. This slogan is not simply about protesting what they see as the “Israeli occupation.” It is an expression of hate and a call for death to Israelis, the report notes. PYM also used the slogan “Intifada, Intifada, long live the Intifada” at the National Students for Justice in Palestine (SJP) conference that took place at UCLA in November. PYM leader Mohamad Nabulsi led the conference in the chants and PYM uploaded it to their Instagram. The video has since been removed. These two instances of support and endorsement of violence are not new for PYM. Since PYM’s founding in 2011, it has shown support for Palestinian terrorists and justified terror attacks. For example, on November 12, 2018, a PYM delegation to Israel and the PA spent time with Yacoub Odeh, a member of the US-designated PFLP terror organization. In another example, PYM supported the actions of Mohammad Tareq who carried out a terror attack on July 26, 2018, stabbing three Israelis before he was shot dead. Following Tareq’s death, PYM shared Tareq’s words before he carried out the attack on the PYM Facebook page. Additionally, PYM has venerated and honored Ghassan Kanafani, the former leader and spokesperson of the PFLP. Kanafani was assassinated by the Mossad in 1972 for his role with the PFLP and his involvement in the Lod Airport massacre. PYM has instituted an annual writing scholarship in his memory. PYM also sells Kanafani t-shirts on its online store. Moreover, PYM has extolled and praised Basil Al-Araj, a PFLP terrorist who was shot dead by IDF forces in 2017 for his involvement in planning and executing terror attacks against Israelis. In March 2017, PYM hosted an event in Washington, DC titled “Protest the Murder of Palestinian Youth Leader Basil Al Araj.” PYM also translated and disseminated Al-Araj’s writings on the PYM Facebook page and website. Similarly, it has organized numerous anti-Israel events throughout the US, but is particularly concentrated in the state of California. PYM also shared an event on its Transnational Great Return March that Samidoun held in London marking “100 years of fighting Zionism, colonialism and imperialism.” The Facebook event picture that PYM shared included a photo of PFLP leader, Ahmad Saadat. PYM has worked together with Samidoun, a group affiliated with the PFLP. Samidoun’s leaders, Khaled Barakat and Charlotte Kates, are PFLP members and Barakat is also the International Coordinator for the “Campaign to Free Ahmad Saadat,” a prisoner, terrorist and the former secretary-general of the PFLP. In March 2017, Samidoun representative, Adnan Farsakh spoke at a PYM event in support of Basel Al-Araj. Later the same year, Samidoun co-sponsored a PYM event in New York in support of Palestinian security prisoners. Over the last 10 years, PYM has managed to establish its presence in the US. Its new chapters, two successful summer schools, prominent presence at multiple National SJP conferences and other Palestinian-related events, are proof that PYM’s message is becoming increasingly attractive to Arbs who attain a Palestinian identity. PYM’s future development plans only further indicate that PYM has become a leading voice among the so-called Palestinian diaspora and has plans to navigate discourse and activism in the future. 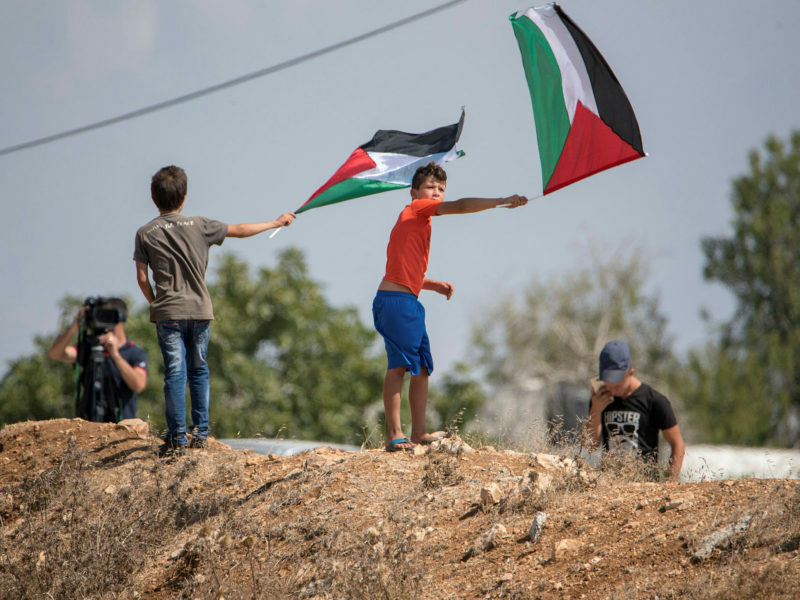 PYM’s stature in the Palestinian community, coupled with its emphasis on intersectionality and cross-struggle solidarity, will likely lead to further collaboration and the growth of PYM’s influence, the report cautions. “Thus, it is essential to undermine PYM’s legitimacy, limit its organizing capabilities, and hold its donors as well as its fiscal sponsor, responsible for enabling its activities,” the report concludes.